Reinforcers influence behaviour 24/7. But what is a reinforcer? How does it influence behaviour and how does it differ from a reward? A reinforcer is something that maintains, strengthens or increases behaviour; the person’s choice or opinion about the reinforcer is irrelevant. Although my intention may be to increase a behaviour, unless it intensifies it has not been reinforced. A reward is presented either with the intent of reinforcing the subject, or because the person finds giving the reward self-gratifying. This is an important distinction, because a reward does not necessarily reinforce behaviour. I might find cuddling my dog rewarding, but my dog does not necessarily share the same amount of pleasure. There are many types of reinforcers at work, and their strength is fluid depending upon many factors including the environment. How successful we are in using reinforcers to change behaviour depends largely upon our skills in applying them appropriately and effectively within those particular surroundings, on that particular day, with that particular dog. It is the behaviour that is reinforced, rather than the person or dog. Behaviours are constantly subject to reinforcement, both those we desire and those we would wish to weaken or even eliminate entirely. Behaviours are labelled “wanted” and “unwanted” only in our human world, since our canine companion has canine sensibilities. All behaviour have an antecedent – something that triggers the behaviour, followed by the behaviour itself, and a consequence that will have an effect upon whether the behaviour strengthens or weakens. By learning to use reinforcers carefully, thoughtfully and effectively we can strengthen behaviours and by entirely removing the consequence reinforcing the behaviour we can weaken or extinguish behaviour, for our mutual benefit. Through our own lack of awareness we often inadvertently punish “good” behaviour and unintentionally reinforce the very behaviours we want to diminish. Our dogs are accomplished at using reinforcement to change our behaviour. Sometimes more accomplished than we are at changing their behaviour. We create an artificial living environment for our dogs. We expect them to suppress natural behaviour and we create a world that strengthens the “wrong” behaviours. Dogs are dogs, and living harmoniously at times means compromise on both sides. What is punishing to the dog can be rewarding to us, and what can be frustrating to us can be reinforcing to the dog: simultaneous reinforcement and punishment can be two sides of the same coin. Behaviour is like constantly shifting sand, as are reinforcers and their ‘weight’ of influence. What one person finds reinforcing another person may not. Personally I adore chocolate, but is it always a reinforcer? Perhaps not. For the chocolate to be a reinforcer, it must change my behaviour in some way. If I am enjoying chocolate dessert, I may have seconds but if I eat thirds it may make me feel sick. In these circumstances the taste of chocolate that had once served to increase my behaviour, could now be considered a punisher as it decreases my behaviour. There are many types of reinforcers, food being the one most commonly used for training. Food is a primary reinforcer, one that requires no previous knowledge or understanding. Other primary reinforcers might include instinctive behaviours such as playing, chasing, or rolling in canine ‘perfume’. 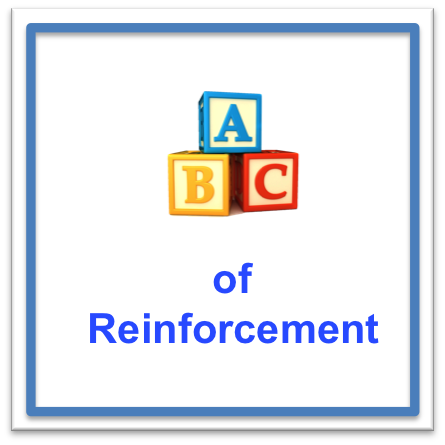 Secondary reinforcers, also called bridges, are a link between the behaviour itself and the forthcoming reinforcer. The “click” of a clicker is a secondary reinforcer that indicates food or play will follow; a whistle or eye contact could also be a secondary reinforcer. Things become more complex when we unintentionally reinforce behaviours – often with something as simple as attention. Behaviours such as jumping up, pulling when on a lead and not coming when called can all be inadvertently reinforced. A combination of reinforcers may be involved – our actions, instinctive behaviours, successful outcomes – are all pulling the strings. For example instinctive behaviour may initiate jumping up, because one of a pup’s very first behaviours that is reinforced is the paws ‘paddling’ against mammary glands in response to the suckling reflex. Jumping up also happens as a result of the physical differences in our height compared to our dog’s. Attention by us then continues to strengthen the behaviour, albeit negative attention. Practice makes perfect! Pulling when on a lead is reinforced by moving forwards. We can also unintentionally punish behaviours we do want. Coming when called means the dog must stop what he is doing (usually a powerfully self-reinforced instinctive behaviour such as play or sniffing) in preference to something far less rewarding. Going home. If we have a behaviour we wish to maintain we should not ignore it and assume it will continue without reinforcement – especially as those behaviours we dislike tend to receive more reinforcement, through attention, than those we desire. In order to change the dog’s behaviour, we must look inwards and ask if we need to first change ours. If we don’t wish our dog to jump up, how are we going to change our behaviour and the behaviour of those around us, to prevent it? How can we create a world where jumping up is not reinforced? This might be by establishing a ‘meeting and greeting’ protocol with everyone who comes in contact, which fails to reinforce the jumping up and reinforces a suitable alternative. Once a behaviour becomes well established, reinforcing a more suitable alternative may need to be continued for a long time or even for life. Muscle memory has been built, and old memories are rarely, if ever, completely forgotten and may be triggered some considerable time later by certain stimuli. We must also consider that behaviours do not happen in isolation. The person who has asked their dog to sit after he has jumped up, and reinforced the sit with food or attention, has merely served to strengthen the jump -> sit behaviour chain of events. Good intentions have unfortunately reinforced both the jump as well as the cued sit, because behaviours come within a ‘package’. Good intentions are not reinforcers. If we wish our dog to stop a particular behaviour we need to ask ourselves the question: what would the dog like instead? How will we fill the ‘gap’? The most considerate approach is ensuring unwanted behaviour does not start in the first place, by preventing the dog’s access to the reinforcer. If you do not wish your adolescent Golden Retriever to chase the ducks on the pond, walk elsewhere until your dog has the skills to ignore the birds and the instinctive ‘window’ when the behaviour is likely to increase, has lessened. If you do not wish your Jack Russell Terrier to bark at every passer by, then don’t give him a bird’s eye view of the footpath through the window. We reinforce behaviour 24/7: the good, the bad and the ugly. Our dogs do not measure their behaviour in our terms. So if your dog does something you like, continue to reinforce the behaviour. If, on the other hand, your dog does something you dislike, take a step back and look in the mirror. Ask yourself what or who the reinforcer might be – you may be surprised to find it is much closer to home than perhaps you first realised. Bond, C (2012). Technical Editor. Learning About Dogs Ltd.
Laurence, K (2010). Inside Track on Reinforcement virtual course. Learning About Dogs Ltd.